Lower Sukhumvit is the centre of Bangkok nightlife – Sukhumvit Soi 11 has some of Bangkok’s most famous nightclubs, while Soi Nana (aka Sukhumvit Soi 4) and Soi Cowboy at Asoke intersection are two of the city’s infamous red light districts. By day Lower Sukhumvit is a bustling mix of shopping centres and street stalls. Lower Sukhumvit is easily accessible from the Sukhumvit Line of the BTS Skytrain and the MRT Blue Line. A wide range of hotels can be found along Lower Sukhumvit, making it a convenient part of the city to stay in. 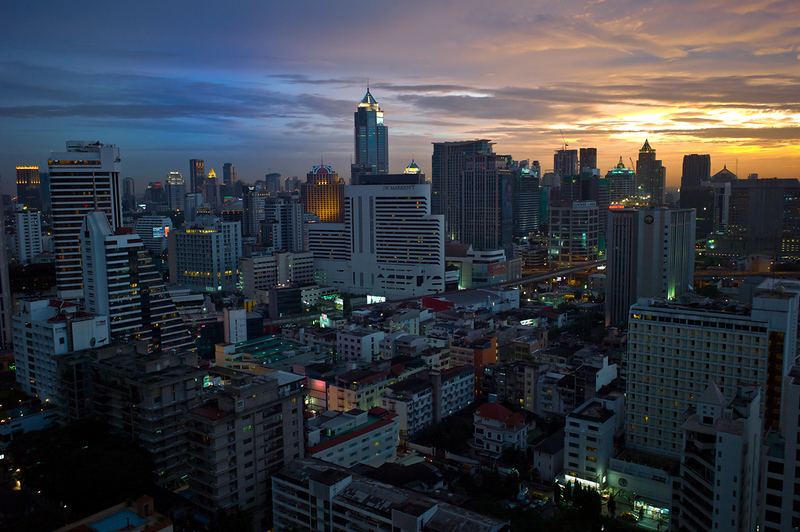 Lower Sukhumvit is home to two of Bangkok’s most infamous red light districts, which offer a surprisingly fun sightseeing experience. Nana Plaza is the more chaotic and seedy of the two, while Soi Cowboy offers a Blade Runner-style neon light experience that’s definitely unforgettable. Located beside BTS Asok, Terminal 21 is one of Bangkok’s newer shopping malls. Unlike the giant malls at Siam, Terminal 21 is mostly made up of smaller boutiques offering local fashion, cool accessories and other unique products. Accessible via BTS Asok or MRT Sukhumvit. 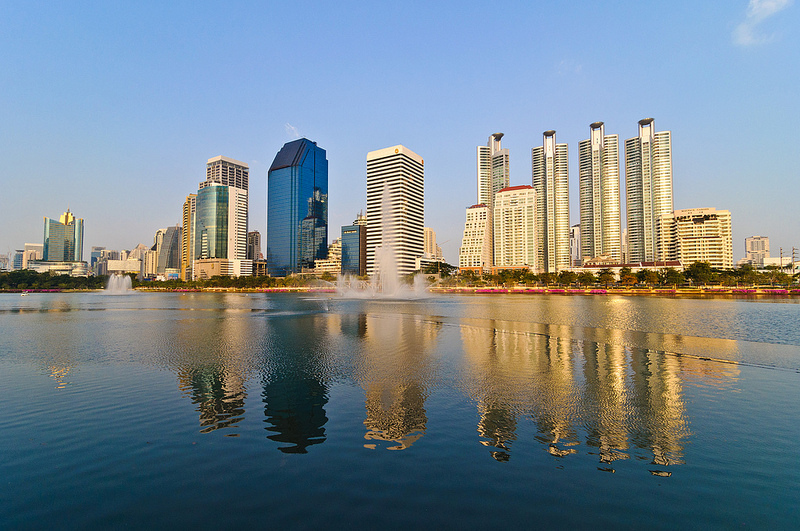 Lower Sukhumvit is home to Benjakiti Park, one of Bangkok’s largest city parks, complete with a large lake and a bicycling circuit. Benjakiti Park is located a short walk from BTS Asoke (you can also reach it from MRT Queen Sirikit station) and is a great place to walk and enjoy the city skyline. The small Chuvit Garden near Soi 10 is currently closed, and probably will not reopen. As the sun starts to set, stalls selling everything from bootleg designer clothing to the travel accessories pop up along Sukhumvit Road. If you’re here to shop, be prepared to haggle as most merchants will offer initial prices that are at least 50% above what they should be. Despite the somewhat seedy location near Sukhumvit Soi 4, Rajawongse Clothier is a high quality tailor favoured by embassy staff, executives and even former President George Bush Sr. Lightweight wool or linen men’s suits start from 12,000 baht. Located in a beautiful old Thai house, Tailor on Ten is much more elegant and relaxing than the typical Sukhumvit Road tailor shop. Owned by a Canadian, Tailor on Ten offers a large range of men’s and women’s clothes with bespoke 100% wool suits priced from 16,500 baht. Lower Sukhumvit is full of Thai massage shops, not all of which are aimed at a reputable clientele. Visit Health Land Asoke on Sukhumvit Soi 21 (located on the block right behind Terminal 21) for a variety of legit refreshing and relaxing massage and spa treatments. Feel like learning Muay Thai — Thailand’s national sport? Bangkok Fight Club, located on Sukhumvit Soi 21 opposite Rutnin Eye Hospital, offers a blend of Muay Thai, Mixed Martial Arts, Brazilian Jiu-Jitsu and other fighting styles for newbies and experienced fighters alike. A short walk from Snapper is Tapas Cafe — a Spanish tapas restaurant serving a variety of great dishes. High quality ingredients, a great wine list and a convenient location make it a good dinner destination before a night out on Sukhumvit 11. Rosabieng serves a menu of classic Thai dishes, from Pad Thai to Tom Yum Goong. Train sets and live music give the restaurant an interesting ambience, while the simple but tasty food makes it a great option for Thai dining on Soi 11. Famous for its excellent burgers (the Premium Burger, which features a 180g Thai-French beef patty, is almost always included in any list of Bangkok’s best burgers), Firehouse is an American bar and restaurant located a short walk from Fraser Suites on Soi 11. One of Bangkok’s most popular Mexican chain restaurants, Coyote serves classic Mexican dishes, from burritos to fish tacos, and great cocktails. Coyote’s Soi 11 branch is open late, giving you the perfect place to eat after a night out. Another Soi 11 favourite, Limoncello serves a range of great Italian dishes and some of the best pizzas in Bangkok. Choose from a great selection of wines and enjoy one of the many classic Italian desserts to complete your meal. Chez Papé specialises in traditional French food. With two chefs — one from Lyon and the other from Bordeaux — Chez Papé’s menu is made up of French favourites, backed up by a great selection of wines. Enjoy delicious vegetarian food in a classic 1940s setting. Na Aroon serves vegetarian and organic versions of classic Thai food, with a selection of seafood dishes also available. The restaurant is located on the ground floor of the Ariyasom Villa Boutique Hotel. Step onto Sukhumvit Soi 3/1 and you’ll feel as if you’ve been transported to Beirut. Home to most of Bangkok’s Middle Eastern restaurants, Soi 3 is the perfect place to stop for a cheap, tasty shawarma and other great Middle Eastern food after a fun night out. Dosa King serves authentic vegetarian North and South Indian food. A great place for lovers of Indian food with a diverse menu that’s sure to include dishes you haven’t tried before. The restaurant is located on Sukhumvit Soi 11/1, a short walk from BTS Nana. Cabbages and Condoms specialises in two things: great Thai food and contraception. Good food and a good cause (the restaurant is used to raise funds for Thailand’s Population and Community Development Association) make it a fun place to dine. Itching for a juicy steak? Great beef is often hard to come by in Bangkok, but the New York Steak House in the JW Marriott Hotel is a great choice. Choose from a variety of large and juicy steaks with price tags to match. Classic Thai food in an open air setting. Suda is located on Sukhumvit Soi 14 (walk down the street a little — you’ll spot the crowds — and serves a wide range of Thai dishes at low prices, making it a good place to stop for a quick meal around Asok. Step off Sukhumvit Soi 20 and into Bavaria. Bei Otto serves a selection of great German food, from Nürnburger rostbratwurst to cold cuts. The attached deli/café offers a huge selection of tasty German desserts and baked treats. Located underneath the skybridge connecting MRT Sukhumvit and Terminal 21, Pala Pizza Romana’s location might not be the most romantic in the city. Its food, however, is fantastic, with authentic Roman-style pizza and a range of pasta dishes on offer. Located on the 25th floor of the Column Hotel, Long Table serves Thai-inspired cuisine with one of the best views in the city. Enjoy the great fusion menu in air conditioned comfort inside or pop onto the balcony for a drink with a great view of Sukhumvit after your meal. From its lavish interior to its fantastic menu, Rang Mahal delivers the ultimate Indian dining experience in Bangkok. Located on the 26th floor of the Rembrandt Hotel, the views on offer here are as exquisite as the food. May Veggie Home serves an extensive selection of MSG-free vegetarian and vegan dishes, including meat-free takes on classic Thai dishes. Located on Ratchadaphisek Road, a short walk from BTS Asok. Lower Sukhumvit is home to a range of sports bars and classic pubs. The Black Swan, near BTS Asok, offers the usual British pub fare. Closer to BTS Nana in Soi 8, you’ll find The Kiwi, a New Zealand-themed sports bar and grill that’s a popular spot for watching rugby games. Other good pubs around Lower Sukhumvit include Mulligan’s on Sukhumvit Soi 11 and Det5, a beer bar and restaurant on Sukhumvit Soi 8 that’s popular for its great combination of Thai and Western food and Belgian beer selection. Sukhumvit Soi 11 is the capital of Lower Sukhumvit’s nightlife. Home to some of Bangkok’s most popular nightclubs and a wide variety of roadside bars, there’s something on Soi 11 for everyone. UPDATEClosing Nov 2017. 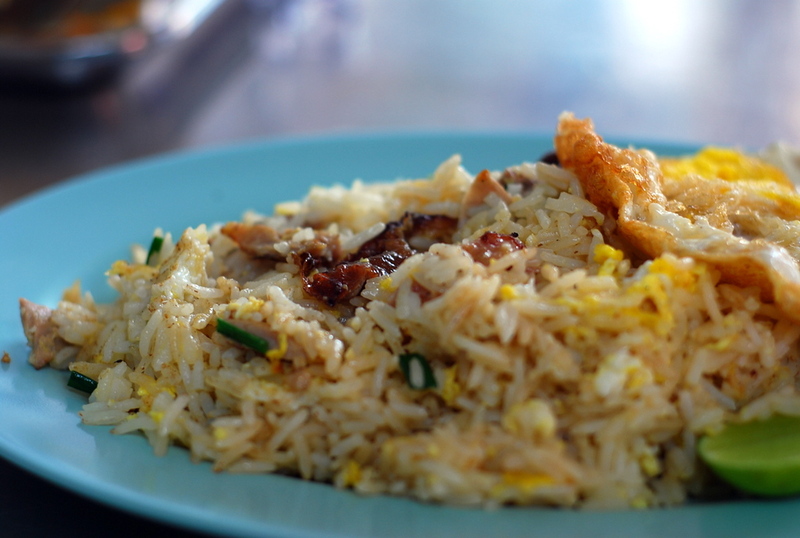 A favourite of tourists and expats alike, the reason for the popularity of Cheap Charlie’s is easy to guess. Cheap beers and strong cocktails make this outdoor bar a great place to start your night on Soi 11 without breaking the bank. Step inside the lift outside ALoft Hotel and you’ll be transported to Levels — one of Sukhumvit Soi 11’s hottest nightclubs. Attracting a mix of locals, expats and tourists, Levels is a Western style nightclub with one of Bangkok’s few respectable dancefloors. Equal parts gastropub and ultra-modern bar, Oskar is one of Sukhumvit Soi 11’s hottest party spots. Oskar offers an extensive wine list — something of a rarity for Soi 11 — and some of the best cocktails on the street. Located on the top floor of Le Fenix Hotel, Nest is one of Lower Sukhumvit’s most relaxed and chilled out rooftop bars. The menu is simple — mostly Spanish tapas and Thai classics — but the great atmosphere, good music and fantastic view makes up for it. Above Eleven is located on the 33rd floor of Fraser Suites, with a view that puts you — well, you guessed it — above Sukhumvit Soi 11. With a fantastic view and cocktails that aren’t as ludicrously priced as Silom’s rooftop hotel bars, Above 11 is a great choice for a night out. Lower Sukhumvit’s second “entertainment zone” is Soi Cowboy — a wild shrine to all things neon located near BTS Asok. 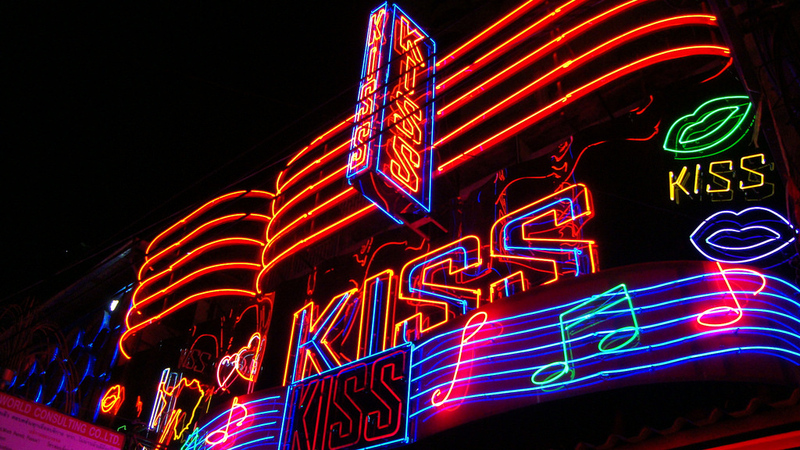 The street’s go-go bars are mostly different takes on the same theme, but its amazing neon lighting makes it an one of Bangkok’s most iconic nightspots. Sukhumvit Soi 4 is Lower Sukhumvit’s seedy nightlife capital. Home to Nana Plaza — one of Bangkok’s three “entertainment zones”, this neon-lit soi is home to hundreds of clubs, go-go bars and other adults-only nightspots. While most Sukhumvit clubs close their doors at 2 AM, there are several after-hours clubs in Lower Sukhumvit that are open until sunrise. Insanity is one such location. It is located on Sukhumvit Soi 12 and is usually open until 4 am, offers another opportunity to keep partying. The soundtrack is bass-heavy trance and house, with a crowd of seedy partygoers and dressed up ladies usually arriving shortly after other clubs close at 2 am. Located a short walk from BTS Nana, Ad Lib Bangkok is an ultra-modern five-star hotel with a fantastic rooftop swimming pool. Despite its close proximity to Sukhumvit’s nightlife, Ad Lib is a quiet and relaxing escape from the noise and activity of Lower Sukhumvit. The JW Marriott offers a huge range of comfortable and luxurious rooms, from standard twin and double rooms to spacious suites. Located on Sukhumvit Soi 2, its convenient location is ideal for experiencing Bangkok’s nightlife and shopping in nearby Ratchaprasong. Less than two minute’s walk from BTS Nana, The Landmark Hotel is a conveniently located five-star hotel in Lower Sukhumvit. Great dining options and a Fitness First health club make it a relaxing escape from the hustle and bustle of Sukhumvit Road. Located between Soi 13 and Soi 15, The Sofitel Bangkok Sukhumvit boasts a wide range of comfortable rooms and some of the best hotel facilities in the city. The 9th floor pool and 24 hour fitness centre make it a great place to relax, unwind and pamper yourself. Luxurious, spacious and conveniently located serviced apartments in Lower Sukhumvit. The Fraser Suites is located on Soi 11, a short walk from Bangkok’s most popular nightspots, and offers a free shuttle service to and from nearby BTS Nana. The Sheraton Grande Sukhumvit is connected to BTS Asok by skybridge, making it a great choice for visitors to Bangkok that want to explore the city. If you prefer to stay in, the hotel’s beautiful oasis-style pool and spacious rooms make it a great place to relax. One of Bangkok’s newer five-star hotels, the Grande Centre Point Terminal 21 is, as its name suggests, located on top of Terminal 21 shopping mall. A convenient location, beautiful views and one of the city’s best swimming pools make it a fantastic place to stay. The Westin Grande Sukhumvit is a short walk from BTS Asok and MRT Sukhumvit. Thanks to its convenient location near public transportation and Lower Sukhumvit’s best restaurants, it’s a comfortable choice for visitors to Bangkok seeking luxury and convenience. Although it’s located close to one of Bangkok’s most notorious nightlife hotspots, the Grand Millennium Sukhumvit offers a quiet, peaceful experience. Spacious rooms and suites, great dining options and a convenient location on Sukhumvit Soi 21 make it a good hotel choice. The Maitria Hotel on Sukhumvit 18 offers spacious, conveniently located and comfortable serviced apartments. Since all of the apartments include full kitchens, the Maitria Hotel is a good choice for visitors to Bangkok seeking the home comforts that other hotels don’t offer. A modern four-star hotel on Sukhumvit 18, Four Points by Sheraton offers the service and comfort of a five-star hotel without the price tag. Rooms are spacious, comfortable and well equipped, while the pool and terrace area is a great place to relax and enjoy the view. Located right in the heart of Sukhumvit Soi 11, Aloft Bangkok is a great hotel for party goers seeking comfortable accommodation in a convenient location. Aloft’s noisy location makes it far from ideal for families, but it’s a great option for solo travellers visiting for a night out. Ariyasom Villa Hotel is a luxurious boutique hotel located on Sukhumvit Soi 1. Built in 1941 as a family villa, the hotel is unlike anything else in the Lower Sukhumvit area and a great choice for visitors seeking an experience of ‘Old Bangkok’. Adelphi Suites is a four-star hotel and serviced apartment building offering spacious, modern rooms ideal for long-term visitors. The Monsoon restaurant serves great Thai food while the outdoor swimming pool offers panoramic views of the Sukhumvit skyline. Located a short walk from Sukhumvit Soi 11’s top nightclubs and bars, Holiday Inn Express is a great option for travellers seeking to enjoy Bangkok’s nightlife. The Holiday Inn Express is a short walk from BTS Nana. Thanks to its quiet but convenient location on Sukhumvit Soi 15, U Sukhumvit Hotel offers a more relaxed experience than the nearby hotels on Soi 11. Rooms are decorated in a modern Thai style and guests have access to a fitness club, outdoor pool and library/study area. Located on Sukhumvit Soi 10, The Blocks Hostel is just a short walk from Lower Sukhumvit’s nightlife and dining options. Four-person dormitory rooms and private rooms are available at affordable rates. Studio Sukhumvit 18 is located on Sukhumvit Soi 18, a short walk from BTS Asok and MRT Sukhumvit. Thanks to its convenient location near Terminal 21, this two-star hotel is a great choice for travellers that want to explore Bangkok. Despite its somewhat seedy location on Sukhumvit Soi 4, the Petals Inn offers great value for money and clean, cosy rooms. Rooms include free Wi-Fi and the hotel is a short walk away from BTS Nana. Lower Sukhumvit is served by its own BTS Skytrain line — the Sukhumvit Line — which has two stops allowing access to Lower Sukhumvit. Most of Lower Sukhumvit’s nightlife is near Nana station, while offices and Terminal 21 shopping mall can be found at Asok station. 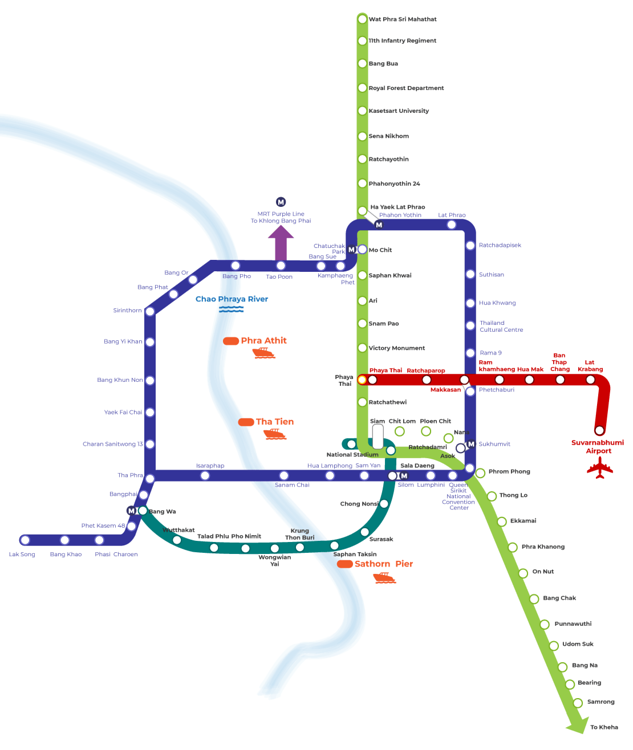 There are several MRT stations within reach of Lower Sukhumvit. The most convenient is Sukhumvit station, which is located beside Terminal 21 shopping mall and connects to the BTS at Asok. Reaching Sukhumvit by khlong boat along Khlong Saen Saep is possible, albeit not ideal. The express boat stops at Nana Chard and Prasanmit piers, both of which allow access to Lower Sukhumvit along Sukhumvit Soi 3 and Soi 21 respectively.